The Area 51 access road is around mile marker 32 on N375. You really can't miss it. It is the wide dirt road leading south toward a distant ridge. The government established a military base north of Las Vegas, Nevada during WWII called Groom Lake. It was setting up to train pilots. In the 50s designated it Area 51. Rumors about Area 51 run throughout the US. 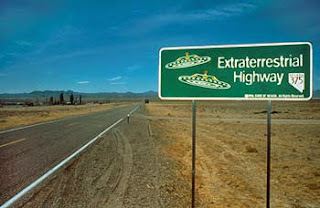 Rumors stating there have been and still are flying saucers, aliens, secret government projects embedded in the history of Area 51.
the Highway 375, designated the Extraterrestrial Highway in 1996. The "Extraterrestrial Highway" is a 92-mile portion of State Route 375, which runs between Hiko and Warm Springs. Area 51 is about 2 miles from Rachel by a narrow dirt road surrounding by desert. Since the military annexed the land that provided easy viewing from the mountains, you can now only view the base from 30 miles away. 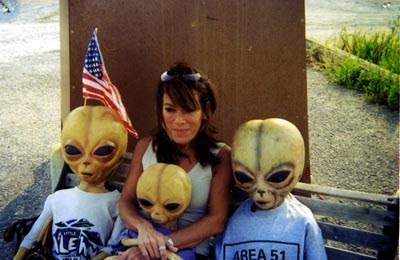 Nearby Rachel, Nevada is also a must see for people visiting Area 51, the Area 51 Research Center, which publishes the Groom Lake Desert Rat magazine, and the Little A'le'inn, http://littlealeinn.com, with its cool alien logo, are here. The Area 51 access road is around mile marker 32 on N375. You really can't miss it. It is the wide dirt road leading south toward a distant ridge. Known as the Groom Lake road, it is in the middle of nowhere. The Little A'le'inn restaurant is like an oasis in the desert for UFO enthusiasts. You can eat, drink, buy alien souvenirs, take some pictures with "ETs" and play video poker. Be forewarned, as with all U.S. Military installations, Area 51 has many signs indicating you are about to enter a restricted area; along with red print at the bottom of the sign which reads, “Use of Deadly Force Authorized”. Continuing beyond this sign will land you in jail with a hefty $700+ fine to pay. "Use of Deadly Force Authorized" is normal for all U.S. Military installations. The weird thing is why all the sensors that surround Area 51 that will alert Area 51 security to an intrusion? Sensors that will trigger a response for vibrations slightly larger than a common desert animal. Other military installations don’t have these, so why all the expense? Why extend the federal boundary around the base? Is the government trying to conceal alien spacecraft? New weapon systems? New top secret programs?